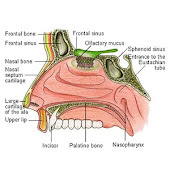 When performing Augmentation or Revision nose surgery, soft tissue is needed. For instance it is used to cover cartilage used to build up area along the dorsum or tip or simply for augmenting an area, say's Dr. Paul Nassif. If doing Rib Harvesting, you can then use the Perichondrium which is soft tissue that lays on top of the rib instead of using temporal fascia. According to Dr. Nassif, it's a little more thicker, heavier, and firmer then Temporal fascia. He feels it's an excellent source of soft tissue. He also has a you tube video on how deep temporal fascia is harvested, but warning it is not for weak at heart. I assume he use's deep temporal fascia as a choice when not performing rib cartilage graft, to build up the radix or dorsum area's. This video on harvesting Perichondrium.is less graphic, but still takes place in Operating Room.